25 1ST READER "There your reasoning stops...just the mere assertion...the mere recognition and back to the perfume of man exalted man. (strongly) We are the children of apes, Mr. Lincoln, not angels, not of clay...no women was ever made of our ribs. Man has so exalted himself, he can't look with comfort back upon his animal nature. Or the weapons, like that cane, that fashioned him and made him the superior species. 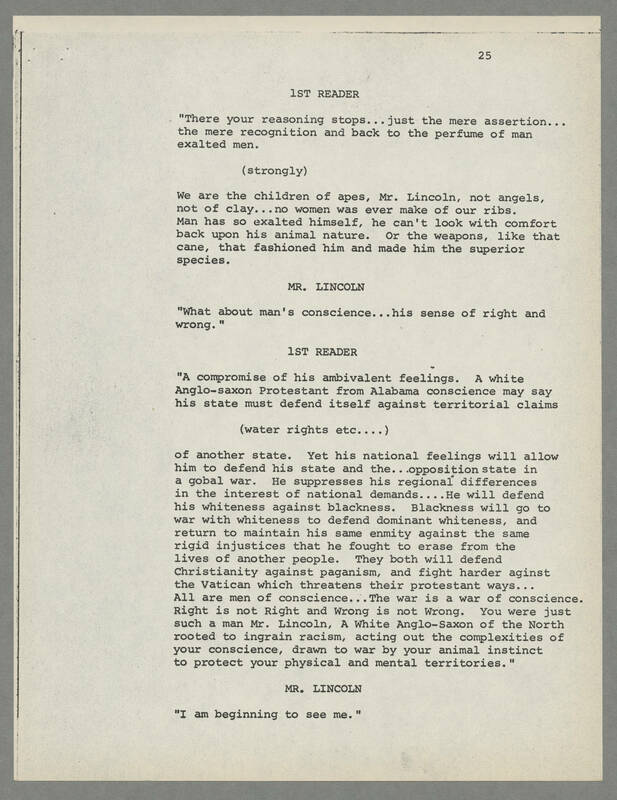 MR. LINCOLN "What about man's conscience...his sense of right and wrong." 1ST READER "A compromise of his ambivalent feelings. A white Anglo-saxon Protestant from Alabama conscience may say his state must defend itself against territorial claims (water rights etc...) of another state. Yet his national feelings will allow him to defend his state and the...opposition state in a global war. He suppresses his regional differences in the interest of national demands...He will defend his whiteness against blackness. Blackness will go to war with whiteness to defend dominant whiteness, and return to maintain his same enmity against the same rigid injustices that he fought to erase from the lives of another people. They both will defend Christianity against paganism, and fight harder aginst the Vatican which threatens their protestant ways...All are men of conscience...The war is a war of conscience. Right is not Right and Wrong is not Wrong. You were just such a man Mr. Lincoln, a White Anglo-Saxon of the North rooted to ingrain racism, acting out the complexities of your conscience, drawn to war by your animal instinct to protect your physical and mental territories." MR. LINCOLN "I am beginning to see me."